Cat YogaCat Yoga is the purrfect way to relax – just ask anyone who participated in the event on Saturday morning. Yoga with cute animals – goats, pigs, cats and more – is a trend sweeping the nation that not even Durango can resist. Four felines joined more than 20 people as they stretched, twisted and found their balance at the Smiley Building, with donations benefiting the La Plata County Humane Society. Spam Carving ContestFifty-five contestants sculpted canned mystery meat into creative shapes during this messy competition, which started in the ’80s but was discontinued for a period of time before once again becoming an official Snowdown event six years ago. Fort Lewis College hosted the event and provided 70 cans of the gelatinous, cube-shaped blocks of meat for the fun. Kim Duvall placed first in the adult category for her creative Spam sculpture of two people ballroom dancing. Canine Fashion ShowDurango is known for being a dog-friendly community, and the only thing people in this town love more than dogs is dogs dressed in cute outfits. 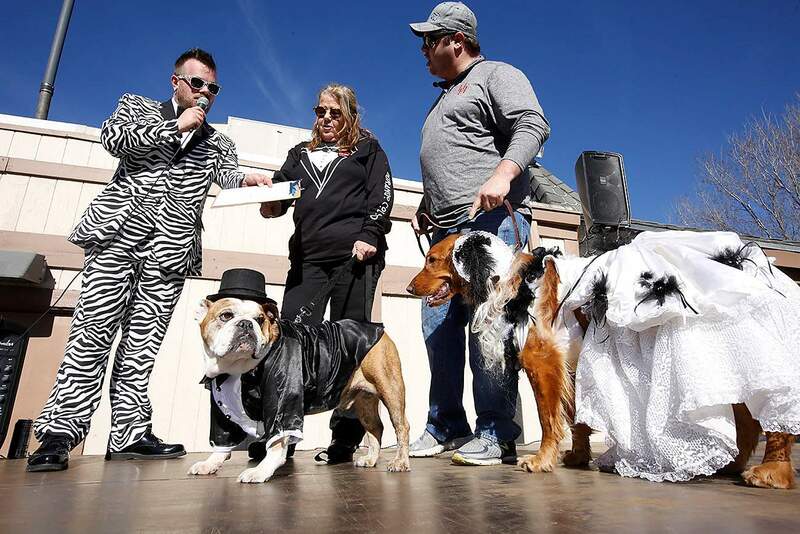 Twenty-eight pooches dressed in their finest attire strutted the runway outside of McDonald’s for the Canine Fashion Show, eliciting cheers from a crowd of more than 100 people. Brian Capsay’s dog, Buddy, won the “Funniest Costume” category at the fashion show. Cammie Willis’ two pomeranians, Carl and Ottis, won the “Best Theme” category at the fashion show. Snowdown FireworksThe unseasonably warm and dry weather did not deter Durango Fire Protection District from launching fireworks on Saturday night in celebration of Snowdown. The fireworks display has been a part of the celebration for more than ten years, and is partially funded by donations from local businesses. The Wells Group, Agritek, Colorado Eagle/Budweiser, Serious Texas BBQ, C&J Gravel and Jaquez Rocket Ranch helped fund the fireworks show for Snowdown 2018. About 30 dogs strutted the runway on Saturday afternoon during the Canine Fashion Show at McDonald’s as part of Snowdown 2018.